Western Arctic Log › What is Ocean Acidification? The purpose of this cruise is to learn about the ocean chemistry of the Arctic Ocean and in particular ocean acidification. So the question is, what is ocean acidification (OA) and why do we care? The short answer is that OA is the decrease in pH of the ocean due to increased free hydrogen ions in the water making it more acidic. We care because with this increasing acidity, the amount of carbonate minerals, in particular calcite and aragonite, available for animals to use for shell production and other metabolic needs, decreases and the ocean becomes under-saturated with respect to these carbonate ions. 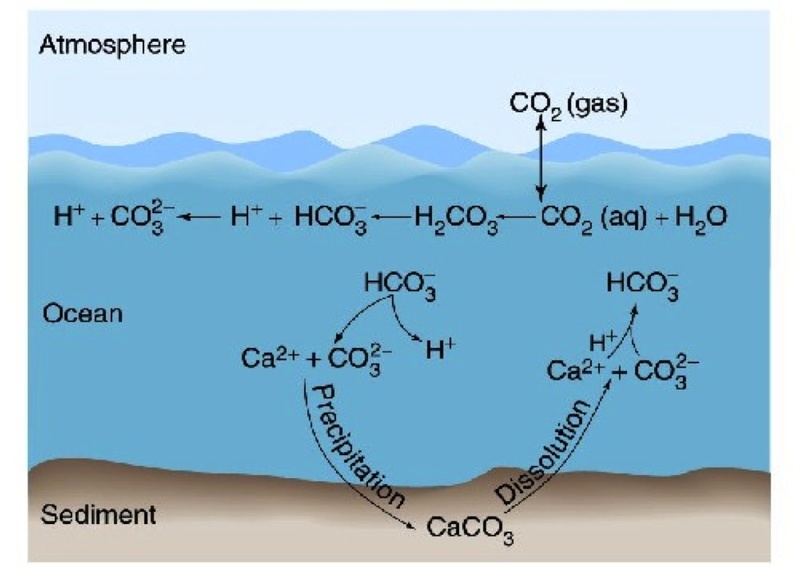 Here is a diagram of the chemical reaction that leads to ocean acidification with the introduction of carbon dioxide, CO2, into the ocean. In the past century, since the Industrial Revolution, more and more CO2 is introduced from anthropogenic sources. The carbon dioxide enters the ocean, a sink for the CO2, where it combines with water and becomes carbonic acid which is very unstable. The carbonic acid breaks apart leaving a free hydrogen atom and bicarbonate. The resulting bicarbonate breaks up farther becoming a carbonate ion and another free hydrogen ion. Acidity is dependent on the number of hydrogen atoms in the water column so with more hydrogen atoms, you get a lower pH or higher acidity. On this cruise, dissolved inorganic carbon (DIC) and alkalinity are measured in order to derive pH. Alkalinity is the measure of the buffering capacity of water or the capacity of the water to neutralize acids. This buffering capacity is largely in the form of bicarbonate. 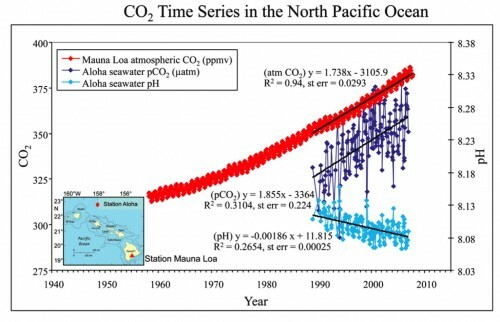 This graph shows the increase in CO2 concentration in the atmosphere since the 1950s and is the longest time series of data for this measurement. The ocean is a sink for much of this CO2 and has taken up between 1/3 and ½ of all anthropogenic CO2 emissions. 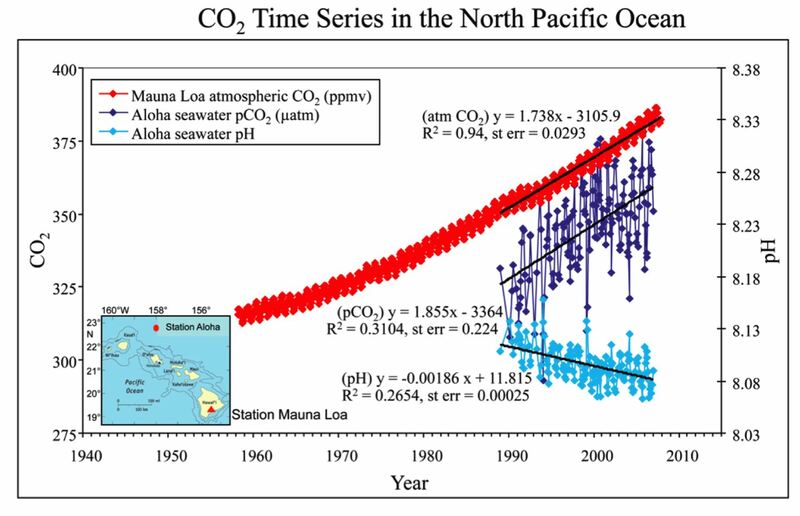 Because the amount of CO2 in the ocean’s surface waters has increased considerably, the acidity of the ocean has increased due to the reaction outlined above. This increased acidity is highlighted in the Arctic regions where the ocean is naturally low in carbonate ion concentration due to ocean mixing patterns and increased solubility of CO2 in cold water. The water samples collected on this cruise will help to build a better, more accurate, picture of how the increasing CO2 in our atmosphere will impact these fragile ecosystems.